R. City is the dynamic duo featuring St. Thomas-born brothers Theron and Timothy Thomas. In addition to being popular singers, the pair are also talented songwriters and producers, having written multiplatinum chart-dominating hits such as Miley Cyrus’s “We Can’t Stop, Nicki Minaj’s “The Night Is Still Young,” and Rihanna’s “Pour It Up,” among others. “Locked Away,” from the duo’s debut Kemosabe Records/RCA Records album, “What Dreams Are Made Of,” has been downloaded 1.4 million times and streamed more than 166 million times in the U.S. and hit #1 on the Shazam Worldwide Top 200 chart. It has reached #1 on Billboard’s Pop chart, #3 on the USA iTunes Top Singles chart and #5 on Spotify’s Global Top 50 chart. The hit song’s moving video was recently #VevoCertified with more than 100 million views. “Voice” coach Adam Levine is the frontman for the Grammy Award-winning group Maroon 5 and has left an indelible mark on popular music. The primary songwriter for the band and a guitar player, Levine’s talents give Maroon 5 its signature sound. His heartfelt ballads and pop anthems have become part of the fabric of today’s pop music scene. The band’s latest album, “V,” debuted at #1 on Billboard’s Top 200 and is a sonic summation of the group’s journey to date. The album’s debut single, “Maps,” set a record for the highest debut by a group on Top 40 radio charts in 18 years and has earned a top 100 spot in 18 countries. The music video for Maroon 5’s char-topping single “Sugar” has logged nearly one billion views to date. The group’s latest single, “Feelings,” is out now. Maroon 5 also recently announced a return to the road with their upcoming Fall 2016 tour. The highly anticipated outing will kick off in San Antonio, Texas on Sept. 3, 2016 and includes dates throughout North America. For additional tour and ticket information, visit www.maroon5.com. R. City will join Maroon 5 on the road as openers on select dates of the fall tour. For complete list of dates, visithttp://everythingrcity.com/. 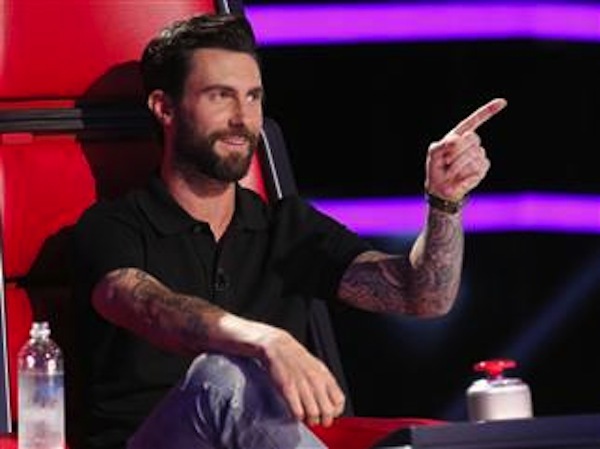 So far this season, the Monday and Tuesday editions of “The Voice” are averaging a 3.7 rating, 12 share in adults 18-49, according to “most current” results from Nielsen Media Research, to keep NBC the #1 network in 18-49 on both Monday and Tuesday nights. “The Voice” is television’s #1 alternative series this fall in every key ratings measure – adults, men and women 18-34, 18-49 and 25-54, plus total viewers.